A Möbius strip, invented by August Ferdinand Möbius (1790–1868), is a three-dimensional object that has only one surface and one border. Möbiuksen ääninauha (“Möbius’ sound tape” in English) is an installation that consists of two parts. The physical part is a sculpture of 0.5″ magnetic tape from VHS/ADAT cassettes woven over a metal frame. The other part is a 4-channel electro-acoustic sound piece that uses random sounds found from old cassette tapes as source material. 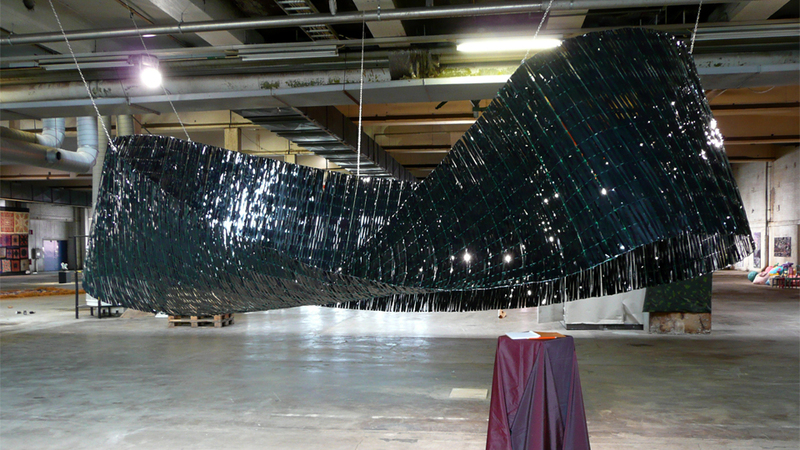 The sculpture recycles obsolete video tape and gives it a new form. The tape has become fabric, yet it still contains extensive amounts of recorded information that we cannot access. The sound activates the whole: the work becomes an imaginary device going through an unknown process that cuts, pastes, mutates and repeats fragments of popular songs, ripples of collective memory from years gone by. Möbiuksen ääninauha observes the theoretically infinite replicability of information and the extreme fragility and impending obsolescence of storage technology. We currently have more information around us than ever before in human history. The means to store it, however, become obsolete, each in turn, faster and faster. If VCR players, for example, are becoming extremely rare in the near future, how much of our cultural achievements will be inaccessible in a longer term? Let’s imagine future archaeologists and their attempts at uncovering information on our times, more and more of which is becoming exclusively virtual. Smart phones excavated from the ruins may be classified as bad mirrors or cult objects. More radical theories may speculate on telepathy and collective consciousness located in an invisible dimension, enabled by unknown technology. Nonsense! How could a declining culture of the late plastic era, whose most popular invention was a simple carriage tool, have managed to accomplish anything so advanced? Möbiuksen ääninauha was selected by jury for ARS Häme 10 event, Forssa, Finland, 2010.